0.038 mm ( 38 Micron ), 0.05 mm ( 50 Micron ) 0.1 mm, 0.125 mm , 0.127 mm , 0.14 mm , 0.15 mm , 0.2 mm , 0.25 mm , 0.3 mm , 0.35 mm , 0.4 mm , 0.5 mm , 0.6 mm , 0.65 mm , 0.7 mm , 0.8 mm , 0.9 mm , 1 mm . We can have other thicknesses in stock at anytime so if what you require is not listed please do not hesitate to get in touch. 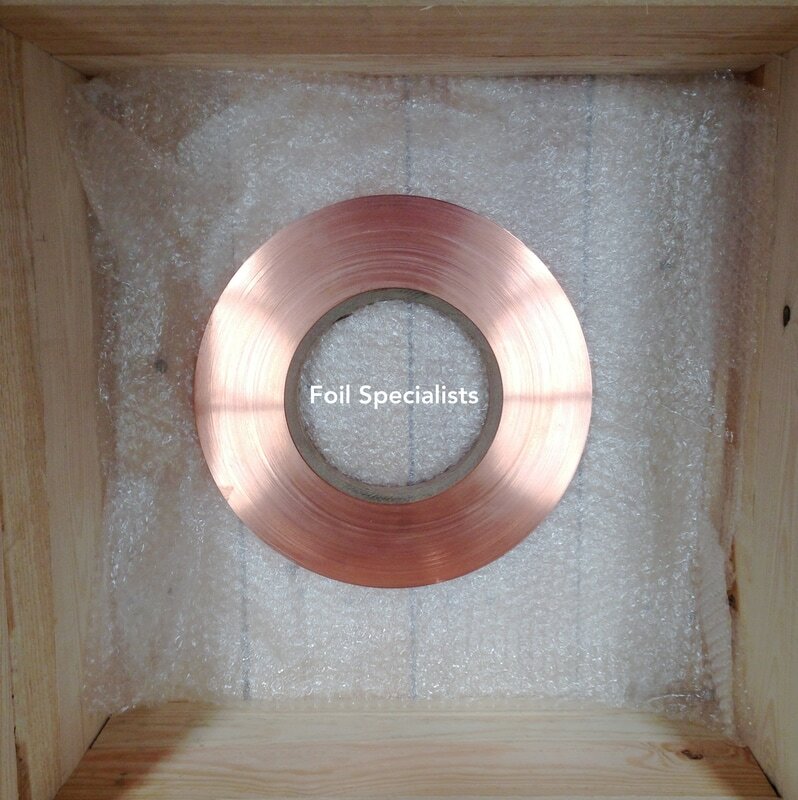 Thickness: 0.05mm-1mm for Copper Foil, strip, blanks and sheet. Other thicknesses available on request. We do stock Copper bar and wire also in varying thicknesses. Width: Standard width 305mm, larger widths are available on request, we can slit down to 3mm or less dependent on application. Temper: Soft (annealed), quarter hard, Half hard and Hard, Full Hard. We do have the ability to do other special tempers on request. Potential Uses: transformers, screens, shims, gaskets, flat copper wire, architectural, marine, connectors, Radiator fins, automotive, heat sink. Thickness: 0.05mm-1mm for Brass Foil, strip, blanks and sheet Other thicknesses available on request. Potential Uses: Within transformers, screens, shims, gaskets, architectural, Radiators. Thickness: 0.10mm-1mm for Phosphor Bronze Foil, strip and blanks. Other thicknesses available on request. Temper: Normally hard, other tempers are available on request. Thickness: 0.05mm-1mm for Copper Foil, strip and blanks. Other thicknesses available on request. Thickness: 0.05mm-1mm for Nickel and Nickel Alloy Foil, strip and blanks. Other thicknesses available on request. Potential Uses: Heat Exchangers, radiators, screens, within transformers. (High temperature applications). medical applications, electronics, plating. Other: We also supply Nickel round bar of varying diameters available on request. Thickness: 0.05mm-1mm for Foil, strip and blanks. Other thicknesses available on request.. Uses: Primarily decorative, artistic uses. Thickness: 0.05mm-1mm for Steel and Stainless steel Foil, strip and blanks. Other thicknesses available on request. Varying different grades depending on application. Thickness: 0.05mm-1mm for Aluminium Foil strip and blanks. Other thicknesses available on request. Temper: Vast amount of tempers and finishes available depending on application. Varying different specification depending on application- made to customer requirements. Insulation/Polymer- Variety of film types, Polyester, Kapton , Nome, various styles of adhesive etc. Uses: Audio/induction Loop- Under shop counters, conference halls, offices, public spaces, medical facilities.